The Virtual Bar uses the latest science to help you not only get a better understanding of how different factors affect your blood-alcohol concentration – or BAC – on an individual level, but also can help you see how your night could go depending on the food you eat, the water you drink throughout the night, and other important variables. It also helps give you a sense of how long it would take for your BAC to return to 0.00, which we think will surprise you. What’s more? 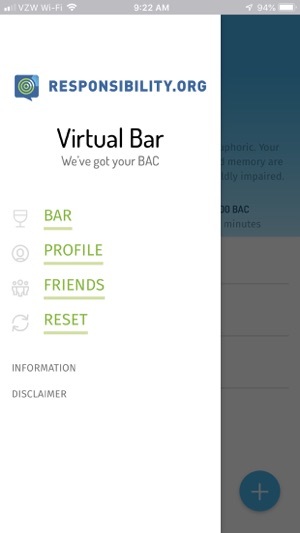 The Virtual Bar will tell you how you might actually be feeling at different BAC levels to help you relate to and better understand the differences between BAC levels. That’s right, we know exactly how you’re feeling. We so get you. Try out the Virtual Bar, and help us help you help yourself. 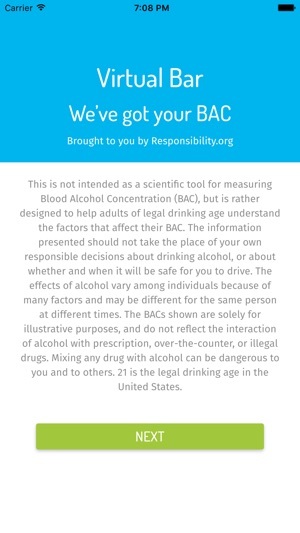 This is not intended as a scientific tool for measuring Blood Alcohol Concentration (BAC), but is rather designed to help adults of legal drinking age understand the factors that affect their BAC. The information presented should not take the place of your own responsible decisions about drinking alcohol, or about whether and when it will be safe for you to drive. The effects of alcohol vary among individuals because of many factors and may be different for the same person at different times. The BACs shown are solely for illustrative purposes, and do not reflect the interaction of alcohol with prescription, over-the-counter, or illegal drugs. Mixing any drug with alcohol can be dangerous to you and to others. Thank you for using the Virtual Bar! 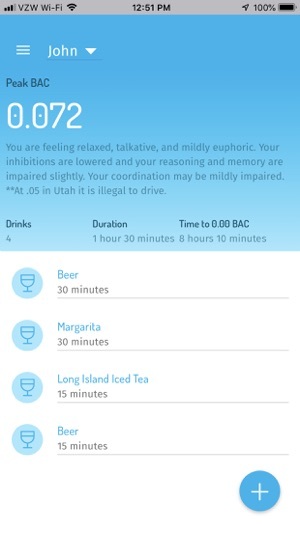 This update clarifies that it's illegal to drive in Utah with a BAC of .05 or higher. It would be game changer to be able to put in alcohol content. There’s a HUGE difference in beer %. I can drink a good beer at 4.8% or 9% alcohol. That makes a huge difference in how quickly I feel effects. Also the food choices are a joke and I really don’t even know what choosing a food does to my results, there needs to be some type of ability to compare. Timing: I wish I could input a time. The only choice is 1 minute, 15 and 30. Dumb. Also, I like how it gives you an estimate time to back to 0BAC. It would help if it counted down for you.